We have negotiated a fabulous rental rate on your behalf with Enterprise Car Rental for your stay in Las Vegas! The negotiated rate is $26.99 per day with unlimited miles for a compact car! You can also upgrade for a few bucks more! To make things easy we have a direct link set up for our group simply click on the image below to go direct to the special site which they have set up for us and book your car. Please note this link is for the exclusive use or our attendees. Are you a Pro-Seminars regular attendee? You may use the link above for savings in other cities also! 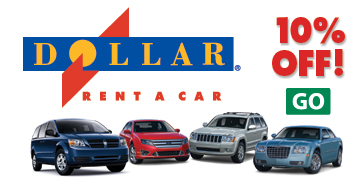 We have negotiated a fabulous rental rate on your behalf with Dollar Car Rental for your stay in Las Vegas! You will receive a 10% discount from the usual rate. You may also call 800 800-4000 and use corporate discount number 3030848.